The complete guide for where to stay in Bordeaux, in the city center and in the vineyards! 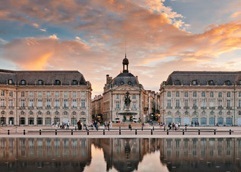 Where to Stay in Bordeaux Bordeaux is an amazingly popular tourist destination. In fact, out of all of France, only Paris receives more visitors on an annual basis. The city of Bordeaux is quite large. Bordeaux is the 9th most populated city in France. While for many people, the vineyards and famous chateau that produce many of the world’s greatest wines are the main reason for visiting Bordeaux, the city center is wonderful example of 18th century French architecture and is now a UNESCO World Heritage site. They earned that designation in 2007. There really is a lot to see and do in the city of Bordeaux and of course the famous vineyards for everyone. If you’re planning on staying in Bordeaux, there are several places to stay in Bordeaux in the city center during your visit. The city of Bordeaux can be divided into a few main sectors: The Golden Triangle, (The shopping area close to the city center near the Opera House), The Historic Area, du Lac, (Near the convention center) Merignac, (adjacent to the airport) Chartrons (the original Negociant quarter) and Saint Jean, next to the Gare Saint Jean train station. For the best in luxury, 5 Star accommodations, in the city of Bordeaux, the most expensive, opulent hotel is Le Grand Hotel de Bordeaux. Le Grand Hotel de Bordeaux is located in the middle of the city center directly across the street from the famous Bordeaux Opera House. La Grande Maison is a new, small, high-end luxury hotel with 6 rooms that offers some of the best dining in all of Bordeaux, headed by the famed, Paris chef, Pierre Gagnaire. For a less opulent, but still quite nice hotel experience, Le Boutique Hotel is a quaint hotel that resembles a townhouse in the city center with a well-stocked wine bar. La Maison Bord’eaux is a small, trendy, boutique hotel with a modern feeling and charm that is owned by Pierre Lurton, the director of Chateau d’Yquem and Chateau Cheval Blanc. The modernist, leaning, La Cour Carree with its austere, Scandinavian style makes a great choice for visitors looking to stay in the city center. Aside from wine tasting at all the great chateaux, today, more than ever, visitors have an endless array of choices for Where to Eat in Bordeaux in the city and in all the various wine appellation of Bordeaux. For better value, our best tips are for L’Hotel de Seze, Burdigala, Yndo Hotel and Le Boutique Hotel Bordeaux. Those are all excellent choices, If you’re looking for something more whimsically, modern looking and hip, the Seeko’o Hotel and Hotel l’Avant Scene in the heart of the city center of Bordeaux are perfect for you. There are also numerous Mercure hotels all over the Bordeaux region, in the city center, business districts, the vineyards or close to the airport and train stations. For budget conscious travelers, there are also multiple locations for Quality Hotels, Novotel, Ibis and Best Western in the city of Bordeaux and in other areas closer to the vineyards as well. Another fun, budget savvy choice in the city center, which is more modern is the Mama Shelter hotel. There is even a popular Bed and Breakfast in the city center, La Villa Chaleemar. If you are green minded, there is the Ecolodge des Chartrons, which is well placed in the city center. If you are like me and you prefer to stay close to the vineyards, hotel accommodations are available in every appellation. In Pessac Leognan, Les Sources de Caudalie is the top hotel and spa in the entire region. Remember, when visiting Pessac Leognan, you have a myriad of choices for where to stay in Bordeaux as you’re not far from the city center of Bordeaux or Merignac. Placed right in the middle of Talence and Pessac Leognan, there is La Reserve. In the Medoc, from south to north there are a multitude of options for where to stay in Bordeaux. In Margaux, Relais De Margaux is right in the thick of things. They also offer a fine golf course. Just a few miles away, for a taste of the wine country life, there is Chateau Rousselle, in Saint Ciers de Canesse, and Chateau Grattequina in Blanquefort. While it’s closer to Margaux than the other appellations in the Left Bank, the Golf du Medoc Hotel et Spa Bordeaux, MGallery Collection provides you with a resort styled experience while visiting the wine region. If you prefer staying the vineyards, in Pauillac, you have Cordeillan Bages for luxury minded guests and for more budget, savvy visitors, Hotel Angleterre is also close to the action. If you’re in the Right Bank, for the best in luxury, the 5 star, Hostellerie de Plaisance in Saint Emilion is the only choice you will want to consider due to its unequaled views, perfect service and starred Michelin restaurant. But Hostellerie de Plaisance is quite pricey. There are several other hotels well placed in the St. Emilion village. In the village, Logis de la Cadene, owned by the popular de Bouard family, of Chateau Angelus fame opened their hotel in 2016. For example, you might want to look into Auberge de la Commanderie, Palais Cardinal, Le Pavillon Villemaurine and Au Logis des Remparts which are well worth seeking out for budget savvy consumers wanting to remain in the picturesque St. Emilion village. For something with a modern touch in Saint Emilion, there is 5 Lasserre. Situated just outside the beautiful Saint Emilion village is the Grand Barrail Hotel and Spa. If you are interested, the Grand Barrail Hotel also has a gold course. Chateau Le Relais Franc Mayne offers several, uniquely, styled rooms, each with their own themed design. There are also several lesser priced hotels available in Libourne, which is just minutes from the vineyards of Saint Emilion, the village of St. Emilion and Pomerol as well. In Libourne, the Mercure provides good value. Les Grands Vignobles and Hotel Kyriad are 2 other budget savvy suggestions. Just outside of Saint Emilion, close to Puisseguin, there is a chateau that looks like a castle, Chateau de Pitray. With a beautiful view of the Dordogne river, just 20 minutes from Saint Emilion, there is L’Arbe Rouge. You can also stay in a centrally located campground for mobile homes and recreational vehicles that is quite close to St. Emilion.